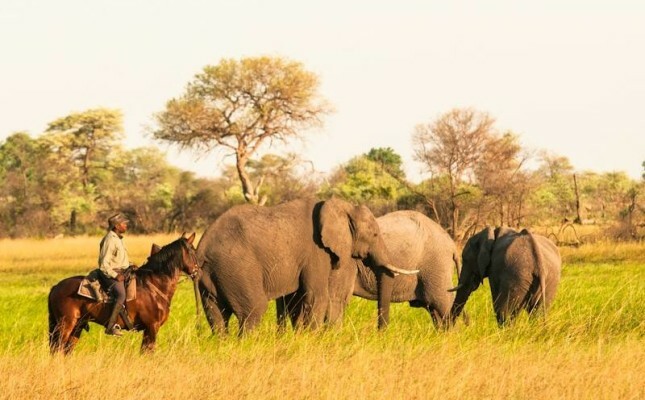 Situated in the pristine wilderness of the Okavango Delta and offering exhilarating horseback safari experiences as well as top-notch luxury accommodation, it’s no surprise that African Horseback Safaris has numerous repeat guests. Some guests visit every year, and others may take years to return. Recently, they hosted a Scottish group and three members of the group had visited 17 years ago! While it had taken the three Fionas’ some time to return, the enthusiasm they had for their first horseback safari was infectious and they spread the word amongst their riding friends back home and came back as a group of eight to celebrate some significant birthdays. Many things have changed in camp over the years; tents have been updated, the number of horses has increased, and the camp has moved on to being completely solar powered. However, some things remain the same. 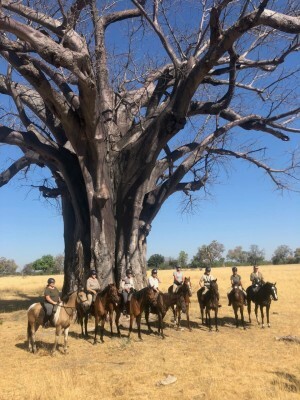 John is still a guide, Bongwe is now a lead guide, and Mod is the horse manager – all of them were there last time the Fionas’ stayed at Macatoo! The ladies wanted to recreate a photo they had taken at the “Big Baobab”. The tree is believed to be almost 2000 years old and is a real landmark in this part of the delta. Locally the tree is known as a Mowana, and it is believed that if you climb the Mowana you will disappear as the tree will swallow you! The tree itself isn’t used, however, the fruits are very useful. They can be eaten, you can make traditional yoghurt from the pith surrounding the stone inside the fruit by whisking the pith with cow or goat milk and adding a little sugar, and the outer shell of the fruit can be hollowed out and used as a cup or bowl as it will stay watertight. 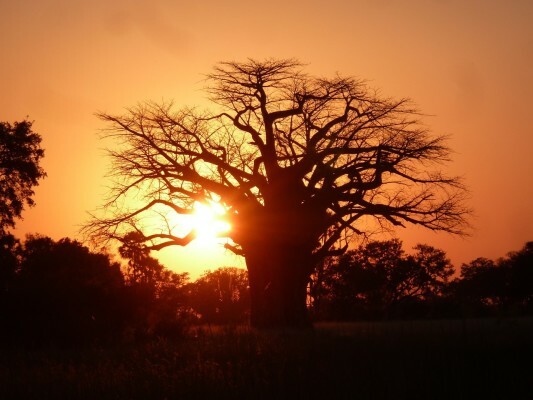 Often there are hollows in the tree that will hold water from many months, so if you are lost in the bush, looking for a baobab may lead you to some water that can be drunk. 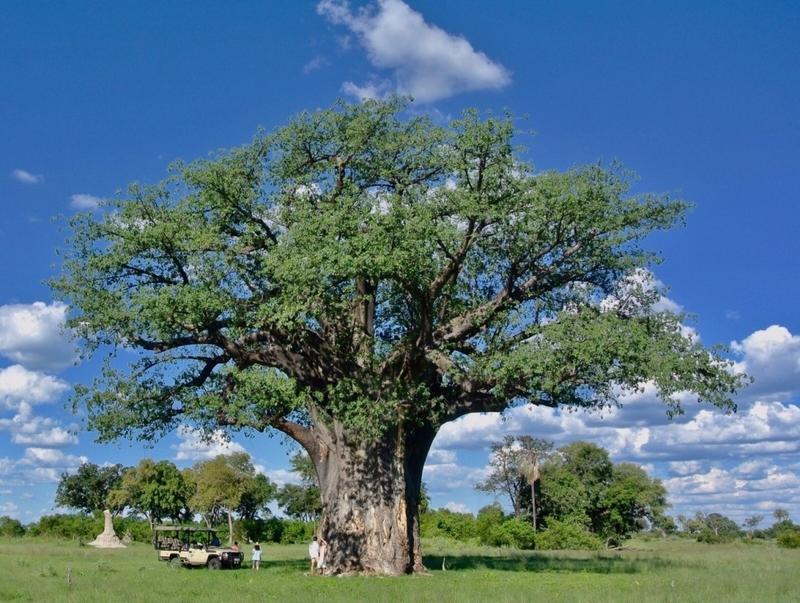 This beautiful and iconic tree is just one of the spectacular sights that guests can expect to be treated to while staying with African Horseback Safaris.